Due to ESB doing electricity work in the area Thoor Ballylee will be closed Monday Monday 4 July 2016. Unfortunately the tower cannot operate without electricity, and power will be cut to allow work on high-level wires. 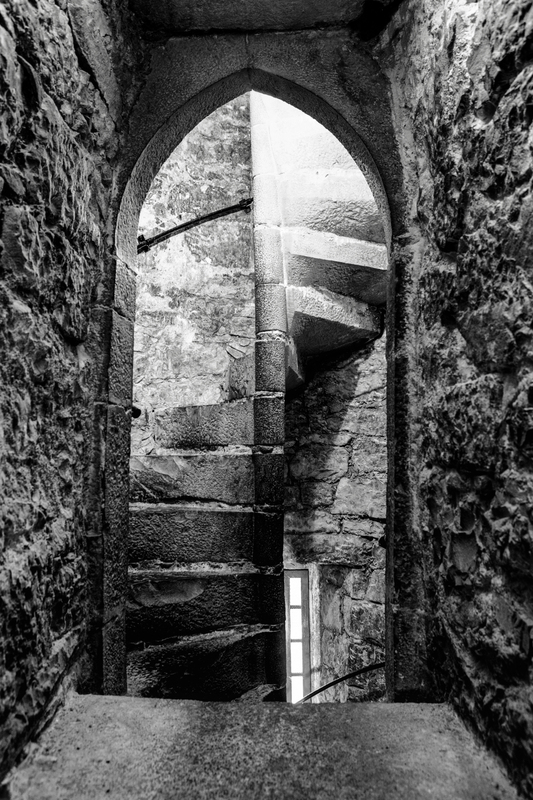 However the tower is open every day for all of the rest of the summer, complete with its new exhibitions and Yeats’s old winding stair. Please accept our apologies for this day of closure. We hope to see you back at this historic building another time very soon. The Yeats Thoor Ballylee exhibition opened by Sabina Coyne Higgins featured widely in local media reports over the last few days. “On Saturday the sun bathed South Galway for the unveiling of the new Yeats Exhibition in Thoor Ballylee which is now open to the public every day over the summer. The Yeats Thoor Ballylee Society was delighted to welcome Sabina Coyne Higgins who officially opened the exhibition, and shared her perspectives on the significance of love in Yeats’s poetry. Since the tower flooded last winter, it was unimaginable that the beauty and tranquility of Ballylee would be enjoyed so soon again. Fidelma Healy Eames, Chair of the Yeats Thoor Ballylee Society remarked, following this year’s redecoration, that the tower gets better after every flood. Cathaoirleach of Galway County Council, Michael Connolly was also present and together with Minister Sean Canney, pledged to ensure that Thoor Ballylee would continue to be prioritised in local flood management programmes. Cllr Connolly also stressed the important role that Thoor Ballylee had to play in bringing national and international visitors to the area and stressed its importance as an integral part of the Galway 2020 offering. Without the generosity of Yeats scholar Joseph Hassett, the exhibition would not have been possible. Mr Hassett was thrilled at the event and gave a sterling speech about the symbolism of the tower in so much of Yeats’s poetry. The new exhibition, curated by Dr Adrian Paterson, Lecturer in English at NUIG, explores Yeats’ relationship with the people and places that most inspired his work. It looks at the culture of the west, its crafts, stories, and songs; the central importance of the women in his life, most especially of his wife George; and his close connections with the landscapes and people of County Galway, with Coole Park and with Thoor Ballylee. 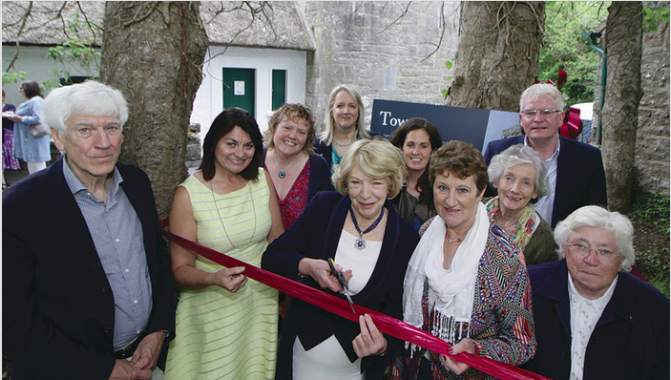 “It is especially fitting that Thoor Ballylee is open thanks to the support of the Galway community. 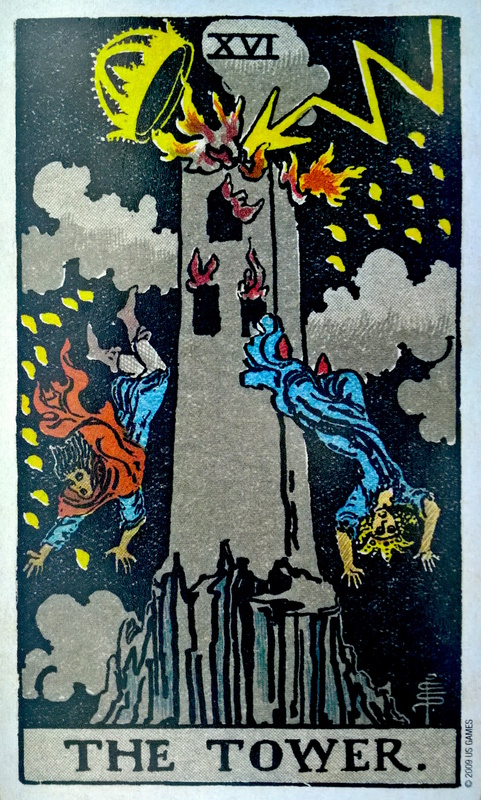 Many local families have a strong connection with the tower, going back even before the arrival of Yeats and his family, and the tower will remain long after we have all gone. As the worldwide Yeats2015 celebrations made clear, Yeats has a worldwide audience from Seoul to San Francisco, but again and again he made a commitment to west of Ireland as his home and as the nourishing soil for his imagination. Thoor Ballylee is the emblem of that commitment. A selection of photos from the opening follows. Due to ESB doing electricity work in the area Thoor Ballylee will be closed Monday 27th June 2016, and in addition Monday 4 July 2016. 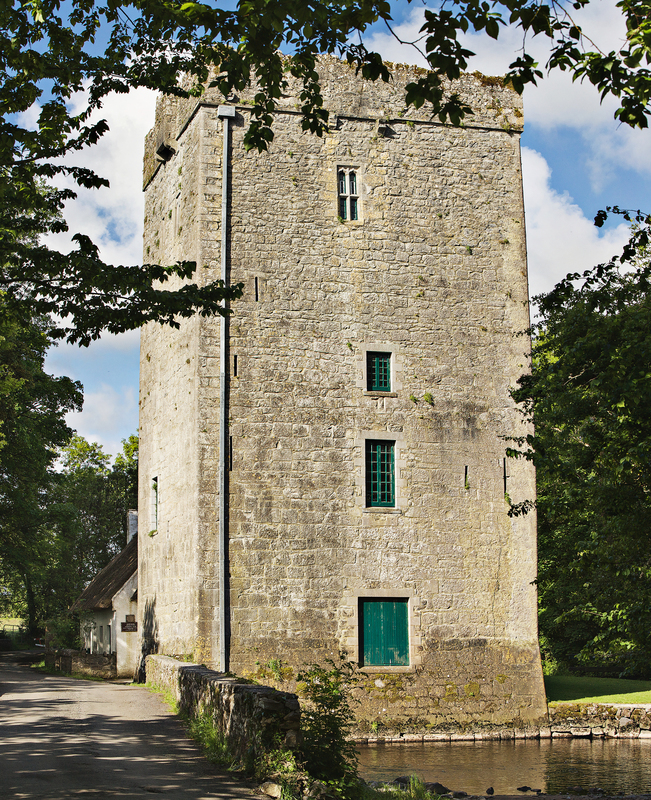 However the tower is open every day for all of the rest of the summer, complete with its new exhibitions and Yeats’s old winding stair. Please accept our apologies for these two days of closure. We hope to see you back at this historic building another time. Thoor Ballylee Yeats Exhibition opens! The Thoor Ballylee Yeats Exhibition opened by Guest of Honour Sabina Coyne Higgins. 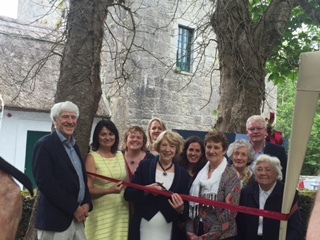 Sabina Coyne Higgins, wife of the President of Ireland, Michael D. Higgins, and in her own right an actress and dedicated supporter of theatre and the arts, opened the inaugural Yeats Exhibition at Thoor Ballylee on Saturday 18th June 2016. A native of Mayo, Sabina Coyne Higgins has a close relationship with Yeats and western culture as co-founder of the pioneering Focus theatre, and through her work with the Lyric Theatre Belfast, a theatre with a history of staging W.B. Yeats’s plays and those of his brother Jack B. Yeats, as well her long association with Druid Theatre, An Taibhdhearc, and other Galway theatre groups. Since the Tower flooded last winter it seemed unimaginable that the beauty and tranquility of this special place would be enjoyed so soon again. However through the sheer hard work and dedication of the local community and the generous support of local and international donors Thoor Ballylee re-opened with a bang for another summer season. Special guests Joseph Hassett, Yeats Scholar & Thoor Benefactor, Fidelma Healy Eames, Chair of the Yeats Thoor Ballylee Society, and Councillor Michael Connolly all gave speeches for the exhibition launch. The event included local music from Gort Comhaltas and refreshments. Using material from NUIG’s “Yeats and the West” Exhibition, and UCD’s “Yeats and His Muses” Exhibition (conceived and produced by Dr Joseph Hassett), Dr Adrian Paterson, Lecturer in English at NUI Galway has curated a new exhibition for the Tower which explores Yeats’s relationship with the people and places that most inspired his work. The Thoor Ballylee Yeats exhibition looks at the culture of the west, its crafts, stories, and songs; the central importance of the women in his life, most especially of his wife George; his talented family and long history of artistic collaborations, and in particular his close connections with the landscapes and people of County Galway, with Coole Park and with Thoor Ballylee. Samuel Palmer, The Lonely Tower (1879). 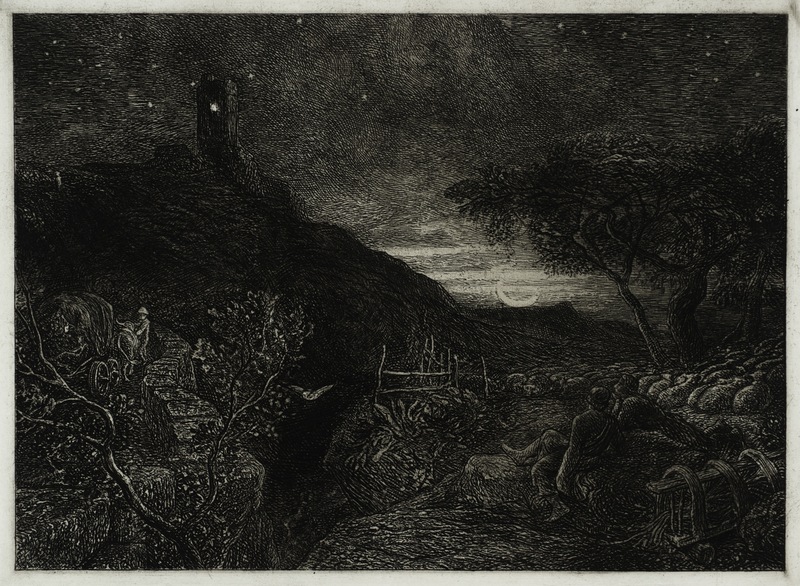 This etching was inspiration for Yeats’s ‘The Phases of the Moon’ and many other Tower poems. 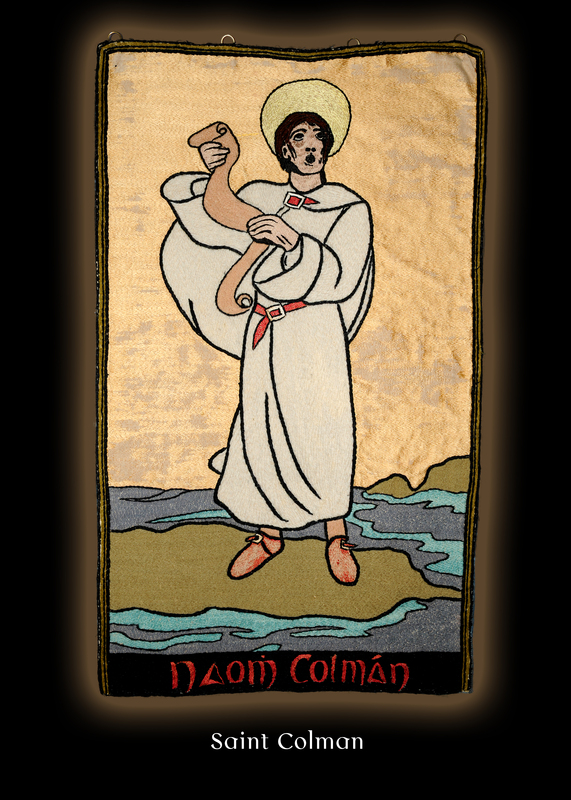 Dun Emer Industries: Banner for St Brendan’s Cathedral Loughrea (1903). 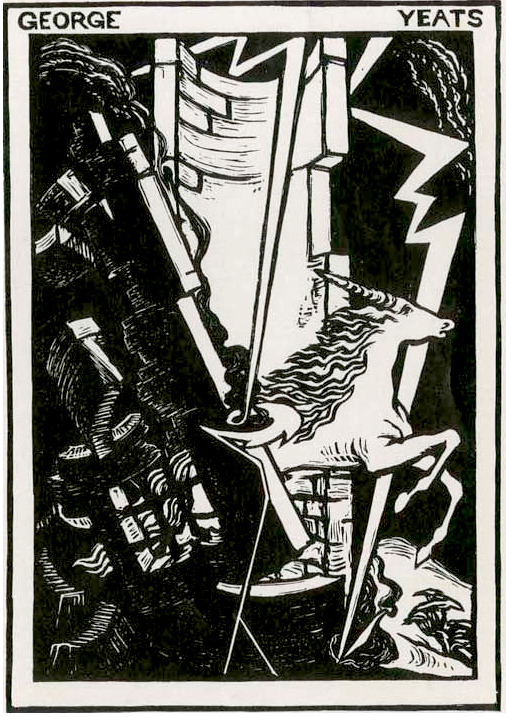 Design by Jack B. Yeats, execution by Lily Yeats and workers of the Dun Emer. ‘Without contraries is no progression’, W.B. Yeats liked to repeat, following William Blake. Born to the most influential artistic family ever to come out of Ireland, the Yeats brothers, the poet W.B. and Jack B. the painter, are contrary characters and contrary artists, but share many things: a deep feeling for place, a delight in idiosyncracy, a gift for expression, and utter artistic seriousness. Thinking about them together sheds new light on both. Their lifelong connection survived disagreements political, artistic, familial, and temperamental, and produced a fascinating series of artistic collaborations from early days around kitchen table with their talented sisters, through a fascination with Irish stories and characters, to the later, magnificent series of Broadsides. It is sometimes forgotten that Jack B.Yeats was also a writer, while his brother started life as a visual artist, while the interest of both in theatre and in song never wavered. Alongside its A Broadside exhibition which features Jack B. Yeats’s prints and ballads, and a new display of the irreplaceable Niland Collection, The Model Sligo hosts the 2016 inaugural Nora Niland Lecture exploring their artistic connections and collaborations. Dr Adrian Paterson is a Lecturer in English at the National University of Ireland, Galway. A graduate of Worcester College, Oxford, and Trinity College, Dublin, he is the author of the forthcoming Words for Music: W.B. Yeats and Musical Sense and the curator of Yeats & the West, an exhibition hosted by the James Hardiman Library at NUI Galway, The Model, Sligo, and shortly to open at Thoor Ballylee. A member of the steering group for Yeats2015, he has published widely on nineteenth and twentieth century art and literature with a particular interest in the artistic interactions of modernism and the fin-de-siècle. For the first time Nora Niland will be publicly honoured at a special event which will take place during the Yeats Day celebrations this year. Born in 1913 in the townland of Ballinastak near Tuam, Co Galway, Nora was a graduate of English and Irish literature from NUI Galway. She moved to Sligo in 1945 where she took up the position of Sligo County Librarian. 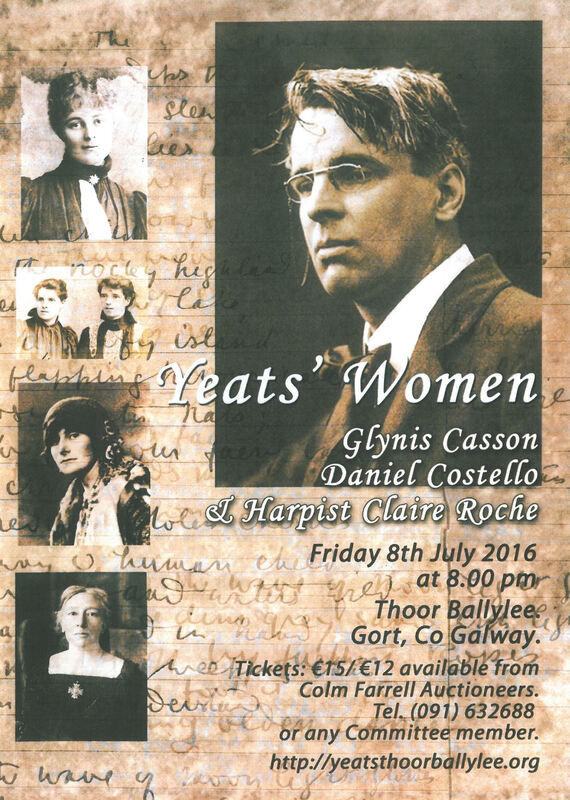 It was then that she began to draw greater attention to the links between Sligo and the influential Yeats family. In 1959 Nora borrowed five paintings by Jack Butler Yeats to exhibit for the first Yeats Summer School. During the exhibition, Niland began to feel that the paintings should remain in Sligo and so she set about raising the £3,000 needed to purchase them in the hope of establishing a public art collection for the county. Two years later her determination paid off, and The Niland Collection was born. Through her efforts Sligo Corporation acquired significant holdings of material relating to the Yeats family and it is now one of Ireland’s most substantial public art collections. The Jack B. Yeats paintings were then housed, together with other Yeats family material and artworks, in a special room in Sligo County Library. Paintings by the Yeats family feature prominently in the Niland collection with almost fifty works by Jack B. Yeats, nineteen portraits by his father John Butler Yeats, as well as works by Jack’s wife Mary Cottenham Yeats, and his sister Elizabeth Yeats. The collection has an emphasis on the northwest of Ireland and features many artists who are linked to the area including Patrick Collins, Sean McSweeney, Patrick Hall and Nick Miller.mIt also features pieces of work by Norah McGuinness, Mary Swanzy, Sean Keating, Gerard Dillon, Paul Henry and Louis le Brocquy. In 2002 a further 30 works of Irish art were generously lent on a long-term basis by the collector Jobst Graeve. The Niland Collection has now grown to over 300 works and is cared for by, and displayed at, The Model Niland Gallery on the Mall in Sligo. Nora Niland never married and when she retired she returned to live in her native Ballinastack. She died in 1988 and sadly failed to get to see her dreams of a gallery to house her pictures come to fruition. To celebrate her contribution in creating this prestigious art collection for Sligo, The Inaugural Nora Niland Lecture in association with NUIG, will take place on Friday, June 10th at 7.30pm in the Model Niland Gallery. It will be presented by Dr Adrian Paterson, a lecturer in English at NUI Galway and a member of the Yeats2015 committee. He will be joined by renowned Jack B. Yeats scholar Dr Hilary Pyle at a special Yeats Salon from 9.30pm. The Thoor Ballylee Society is delighted to announce that Sabina Higgins, renowned actress and partner of the President of Ireland, Michael D. Higgins, will officially open the inaugural Yeats Exhibition at Thoor Ballylee from 1pm on Saturday 18th June. A native of Mayo, Sabina Higgins (nee Coyne) has a close relationship with Yeats and western culture, as co-founder of the pioneering Focus theatre, and through her work with the Lyric Theatre Belfast, a theatre with a history of staging W.B. 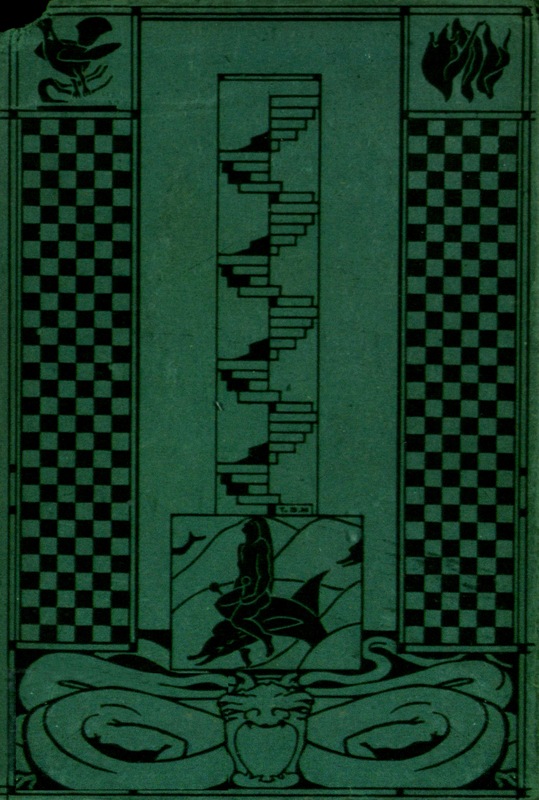 Yeats’s plays and those of his brother Jack B. Yeats, as well her long association with Druid Theatre, An Taibhearch, and other Galway theatre groups. Since the Tower flooded last winter it seemed unimaginable that the beauty and tranquility of this special place would be enjoyed so soon again. However through the sheer hard work and dedication of the local community and the generous support of local and international donors Thoor Ballylee is re-opening with a bang for another summer season. Joseph Hassett, Yeats Scholar & Thoor Benefactor, Fidelma Healy Eames, Chair of the Yeats Thoor Ballylee Society and Councillor Michael Connolly will participate in the exhibition launch. The event will also include local music and refreshments. All are welcome to attend and children will have an opportunity to test their knowledge of the tower with the new Thoor Scavenger hunt.